A 2x3 Wooden Shed is a great way of creating some extra storage without taking up too much space. 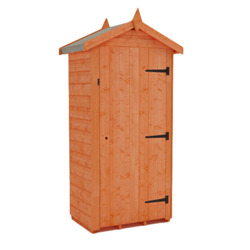 Mrs Whale of Scarborough gave the following feedback about her 2x3 Tool Tower; "We bought a 2x3 Sentry Shed and we are delighted with it. It was easy to assemble and is of a good quality. We painted it and it looks fabulous - a pretty garden feature."